Steel structure shed is a new way to construct buildings, widely applied to workshop, warehouse, car shed, farm shed and other storage sheds. The structural steel serves as the primary structural element of steel sheds as well as the main load-bearing member of them. The steel structure sheds are mainly composed of steel column, steel beam, roof horizontal bracing system and purlin. With regard to your specific usage, we supply a variety of steel structure for shed, such as steel structure shed workshop, steel structure car shed, steel farm sheds, industrial steel sheds and steel storage sheds. The steel structure sheds can be found many uses in both industrial and non-industrial sectors, such as manufacturing, agriculture and civil uses. Workshop: steel structure workshop is the top option for industrial uses, and it can be used for various manufacturing, repairing and assembly lines. This type of building form will save much money for clients in contrast to concrete building. 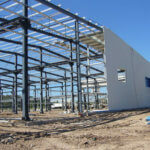 Warehouse: steel structure warehouse is an ideal solution for potential users to store goods. It will save much construction time and cost. Car shed: it is an easy and quick way to build shed for cars. This building form can be seen in numerous civil uses. The steel shed workshop is a cost-effective option for overhead travelling crane users who are thinking about building their own facilities. 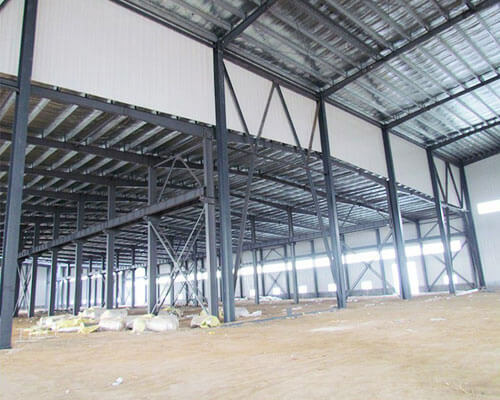 The industrial shed steel structure will be custom designed and built in accordance with client’s requirements, such as the steel structure building dimension, seismic rating and the rated load of overhead crane. Generally, steel columns and beams constitute the main structure of steel shed buildings, and they are usually made of Q345B steel materials. For overhead crane beam, Q345B H section beam is also used. These steel fame shed components are painted three layers. The secondary structure of steel structure shed mainly consists of wall and roof purlin, panels and bracing system. The roof horizontal bracing and wall column cross bracing systems adopt angle steel. The wall and roof panels are available in single color sheet and sandwich panel, and the purlin uses C section or Z section. All components of steel shed structure are connected by high strength bolts. Other structures such as doors, windows, roof gutter and rainspout are customized according to the practical needs of customers. If you have any need for the design of steel structure shed, contact us online now. 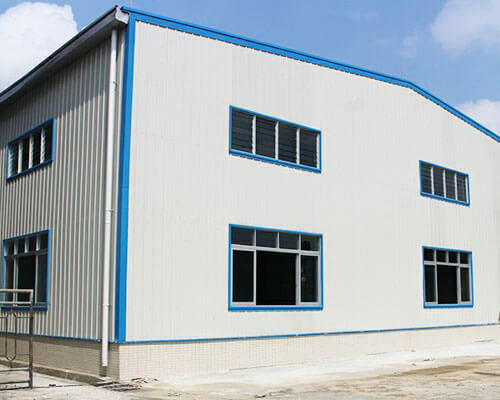 Wide application: the steel structure is suitable for constructing both single-story and multi-story buildings, workshops, warehouses, industrial plants, storage sheds and so on. 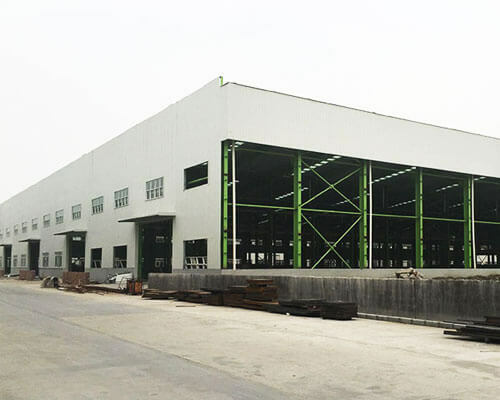 Quick and easy construction process: the prefab steel structure buildings will greatly shorten the construction period as all components will be prefabricated in the factory and then delivered to the construction site to be assembled. 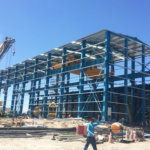 High strength and long service life: the structural steel provides longer span and stronger cantilevers, and the steel shed frame design is done according to wind and snow loading in the local area, making it strong enough to withstand severe environments, such as strong wind, snow and earthquake. Besides, the steel structure shed requires little maintenance. 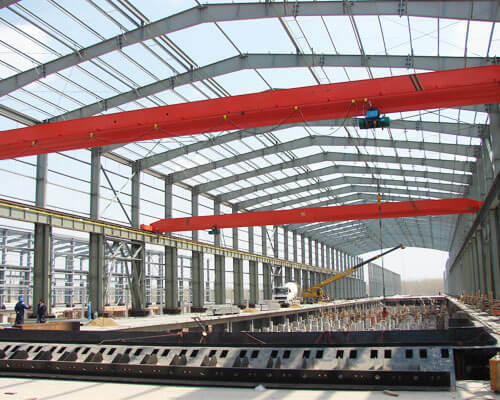 Reasonable cost: it is one of the strong points of steel structure shed, making it popular among overhead bridge crane users who intend to build a steel frame shed. The steel shed kits have light dead weight, so the construction cost can be reduced. In a word, the steel structure shed is an economical substitute to concrete buildings. Environmental protection: the steel materials can be recycled, thus they are harmless to the environment. The steel built sheds can be constructed into any shape and size according to customer’s requirements. 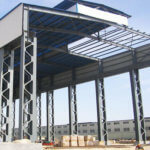 They can also call for light steel structure or heavy steel structure for sheds. 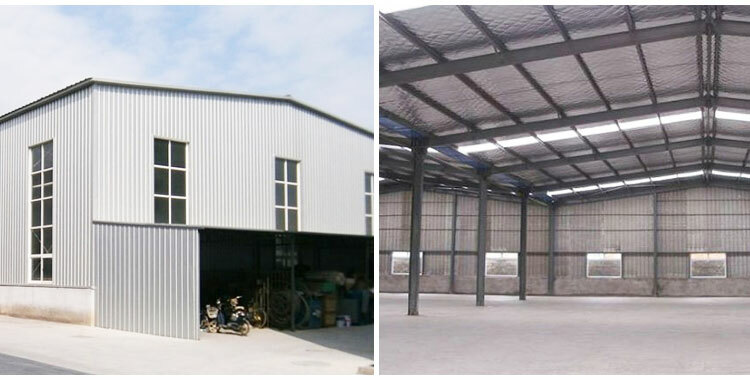 The steel structure shed can be extensively used in many different fields, from industrial usage such as steel industrial shed, agricultural usage like steel farm shed to civil usage such as steel car shed. This building form will save a great deal of time and money for clients. 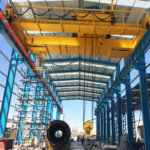 For potential bridge crane users who do not have pre-existing buildings or rent the facilities, we highly recommend steel structure shed for their industrial uses. Preparation before installation: to prepare the installation plan and organize the steel shed construction; to check the steel structure members and arrange them in installation sequence. Primary and secondary erection: this process mainly includes the installation of steel columns, beams, purlins, bracing system, and beam end walls. Other components: to install other accessories of steel structure shed, such as roof and wall panels, doors and windows. Some safety precautions should be taken during installation process so as to ensure a smooth installation progress as well as the safety of workers. For example, any worker entering into the construction site must wear a helmet. The construction machines should be inspected on a regular basis to make sure they are in good working conditions, especially the wire ropes and safety belts. 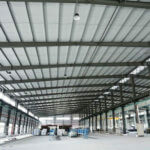 In addition, some protection measures should be taken to prevent damage to steel structure in the installation process. The steel shed prices may be the first concern of many potential buyers. A strong and affordable solution can not only provide durable performance, but save much more costs for you. The steel frame shed kits supplied by Ellsen are with superior quality and high durability so that they can serve for more than 50 years. The customized steel shed design offered by our professional engineers can meet almost all needs of customers. To get a free quotation, contact us online directly. We promise to offer you steel shed plans with competitive prices. Why It Is Important to Select Reliable Steel Shed Manufacturers? In the selection process of steel structure shed, many customers may first focus on steel shed suppliers and manufacturers as they are core factors affecting the quality and durability of your steel structure buildings. It is worth the effort to select a dependable steel structure shed supplier. 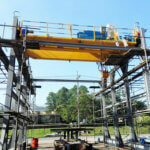 Ellsen machinery supplies many different type of lifting equipment encompassing overhead crane, gantry crane, jib crane, hoists, construction winch and marine winch. 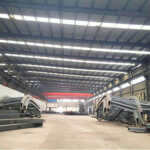 We are also professional steel structure provider and offer various forms of steel structure buildings to clients, such as steel structure workshop, steel structure warehouse and steel structure shop. Based on practical usage, we provide customized steel frame shed plans. To know more about steel shed structure details, call us now or leave a message.